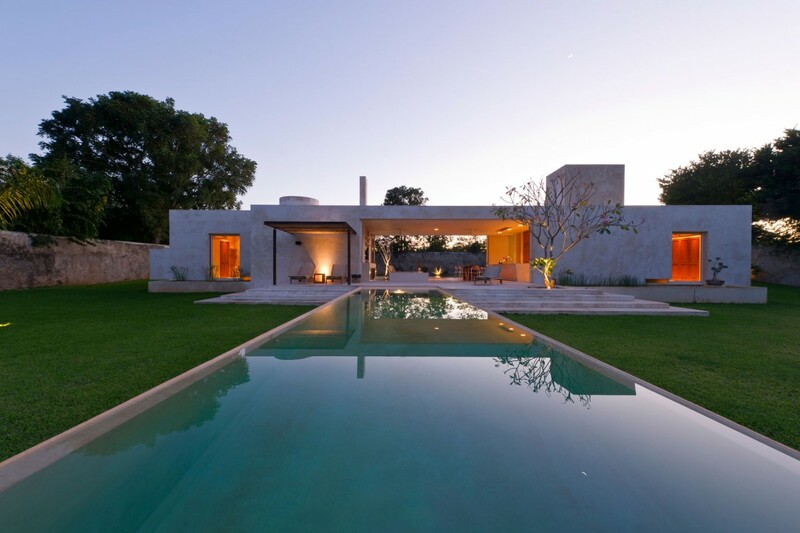 Casa Sisal is a contemporary additional guest house to the restored Hacienda Sac Chich, located in Acanceh, southeast of Merida, Yucatan, Mexico. 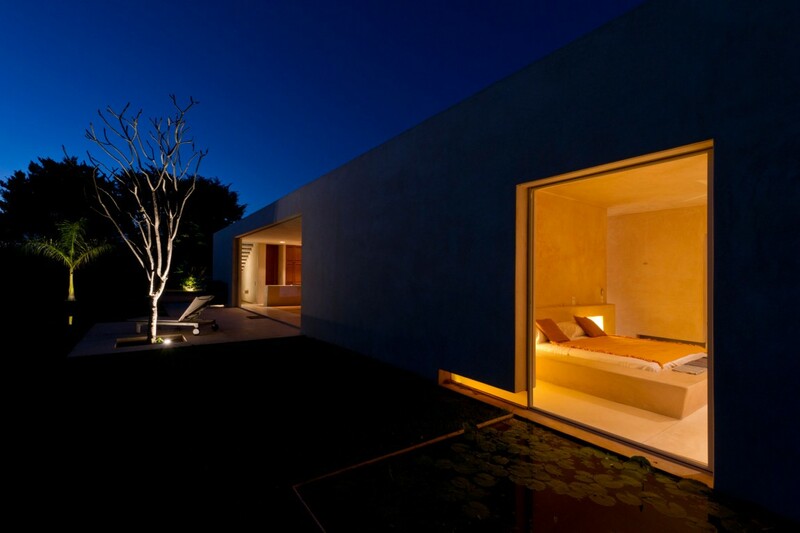 Designed by Reyes Ríos + Larraín Arquitectos, it stands out for its simple, clean lines and materiality. A specially prepared stucco is used as overall finish for walls, roofs and floors, both indoor and outdoor: a cement mix with resin from a local tree. 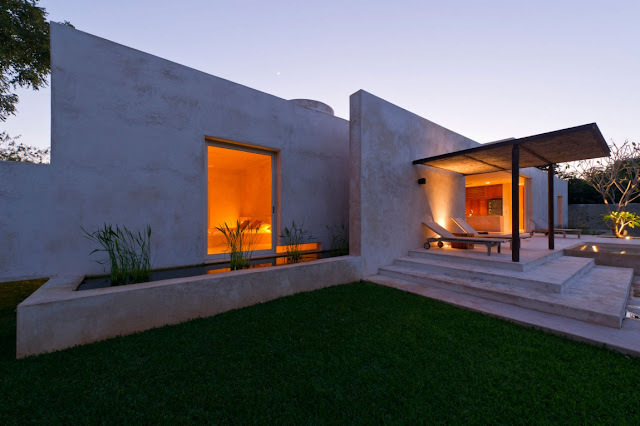 The proposal is synthesized in a geometrically simple volume in contraposition to the “organic and eclectic” architecture characteristic of the end of the nineteenth century that distinguishes the old house of the Henequen hacienda, where the guest house is located. 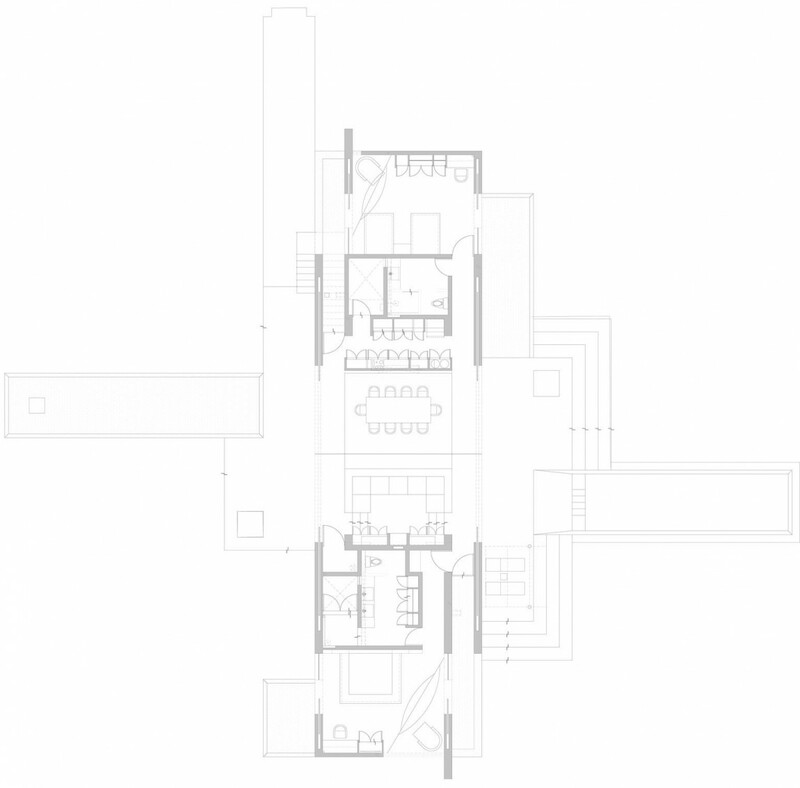 The spatial typology of a typical “main house” of a Yucatan hacienda is recreated. It synthesizes an ancestral wisdom that takes advantage of orientation and wind direction to better adapt to the merciless weather of the region, with a decidedly contemporary language. 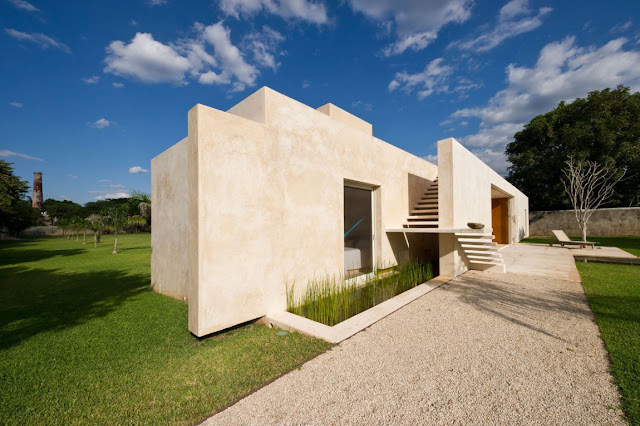 The Sisal House is built on the grounds of what used to be an old patio for air drying henequen fiber. At 45 x 140 meters approximately, it is surrounded by high masonry walls dating from the end of the nineteenth century. 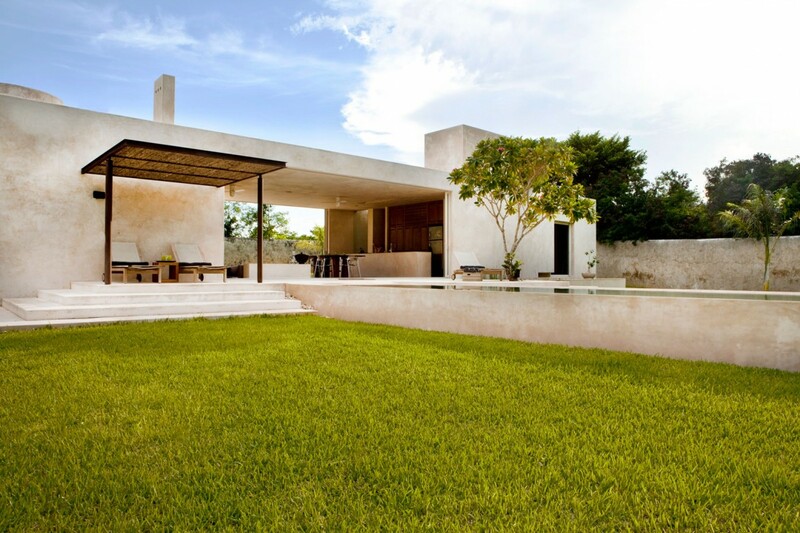 This construction functions as an independent guest house for what was once the Casa de Máquinas de Hacienda San Antonio Sacchich, 35 kilometers away from Merida, Yucatan. 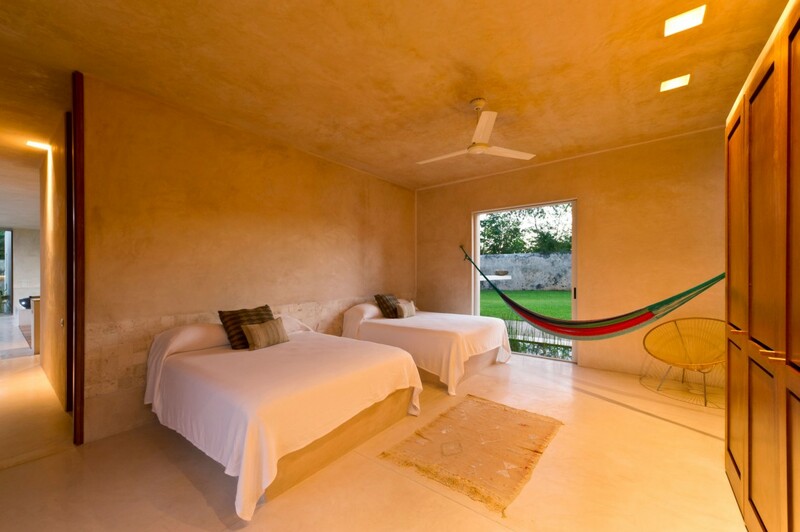 The guesthouse consists of two bedrooms, two bathrooms, living room – dining room – kitchen, swimming pool and terraces totaling of 200 square meters. The design comprises a single volume offset into two planes, to which subtractions of various scales are applied in order to allow for air circulation on its four sides. The plan is organized from a single central place, which contains the living room and works as an adjustable space that can be transformed into a terrace and fully connect to its environment. 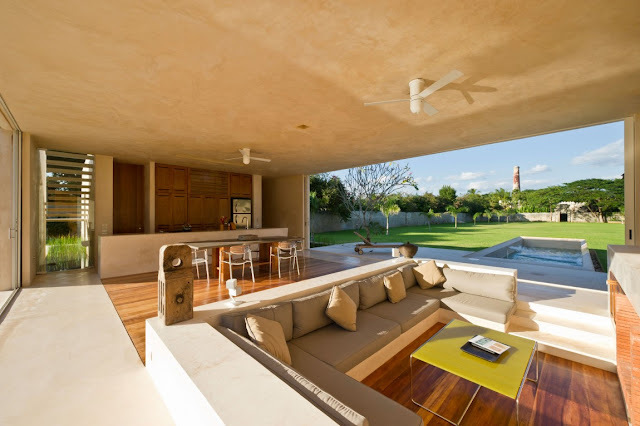 Four independent sliding glass doors, each four meters wide, are hidden in the walls to form an opening on the longitudinal axis of the patio. 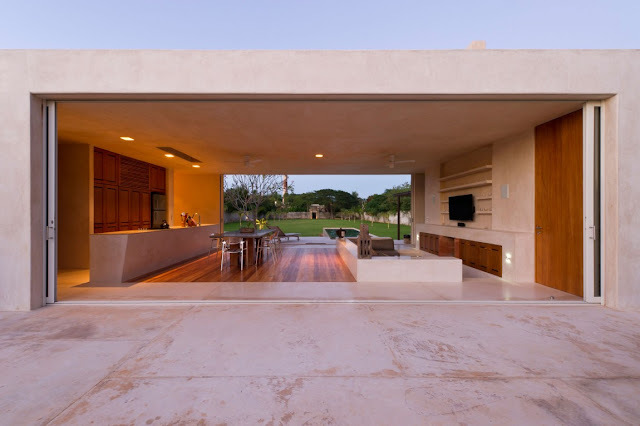 This solution lets us calibrate the natural ventilation of the space and grants maximum flexibility in its use and adaptation to the severe weather conditions of Yucatan. The architecture of this new house is an antithesis to the style and language of the old henequen hacienda while referring to its location within its context. This strategy is reinforced through the use of a stucco prepared with white cement mixed with the resin of “Chukum”, an endemic tree. 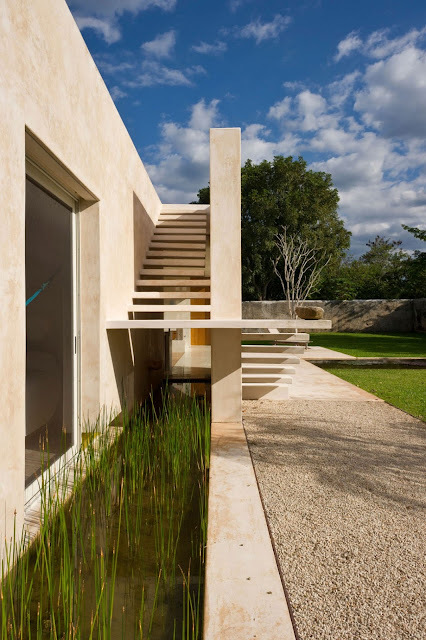 This is an ancient Mayan technique that thanks to our own research, we have been able to recover for its use in modern architecture in Yucatan for the last fifteen years. 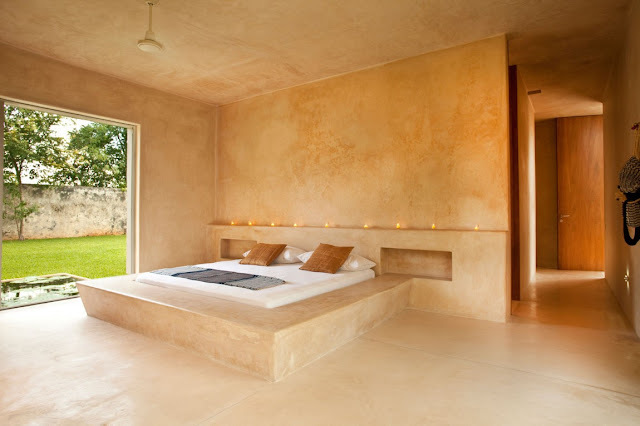 The coating with chukum-cement has impermeable properties and contributes a natural color and organic texture, visual and haptic properties for which we have used it as sole finish material for floors, walls, and roofs. 1. To design a comfortable, practical, low-maintenance house with maximum aesthetic expressiveness and the minimum use of materials and formal devices. 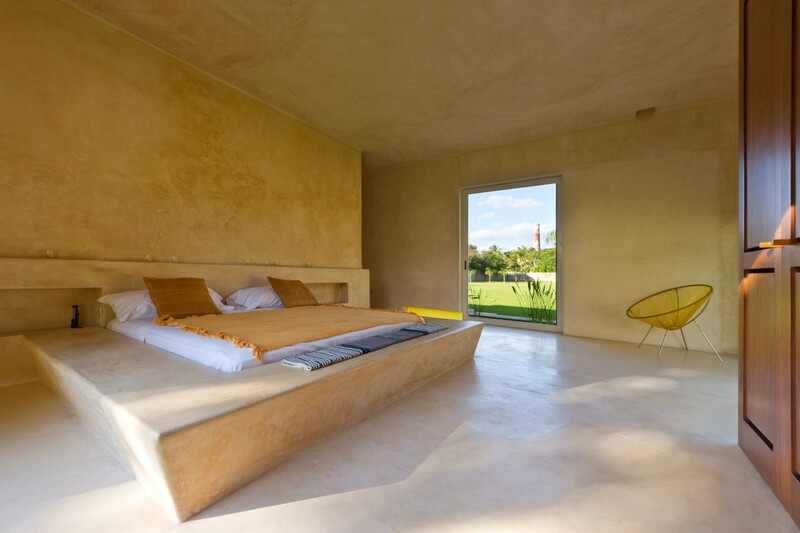 To achieve this, we used a single material as a finish for walls, roofs and floors, both indoor and outdoor. 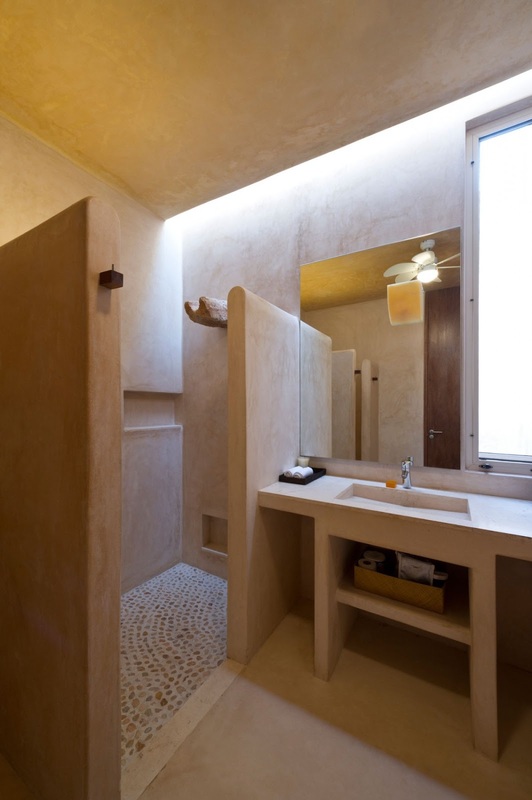 The chukum-cement stucco, which we had the fortune to rediscover and reinvent with modern materials when we got to Yucatan, has been the primary material of this house and of all our office’s projects in Yucatan, where its use has slowly started to extend to other modern works by local architects. 2. 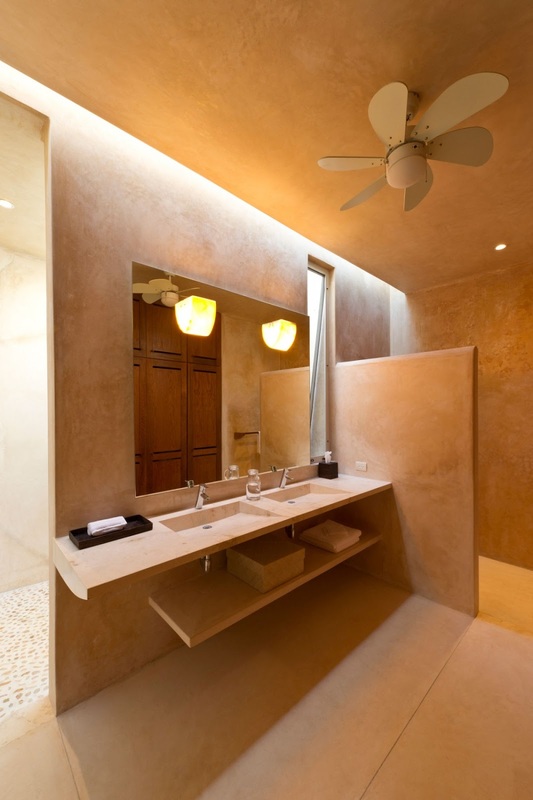 To use “Chukum” as the only finish material for all the surfaces of an architectural project. The Chukum coating is very delicate and imposes strong logistical restrictions on the construction site, given that it has a longer bonding time with cement, which precludes its application during the rainy season without the proper protection. This finish does not allow for leveling surfaces coated on different days, which requires strict planning of the time and areas to coat. 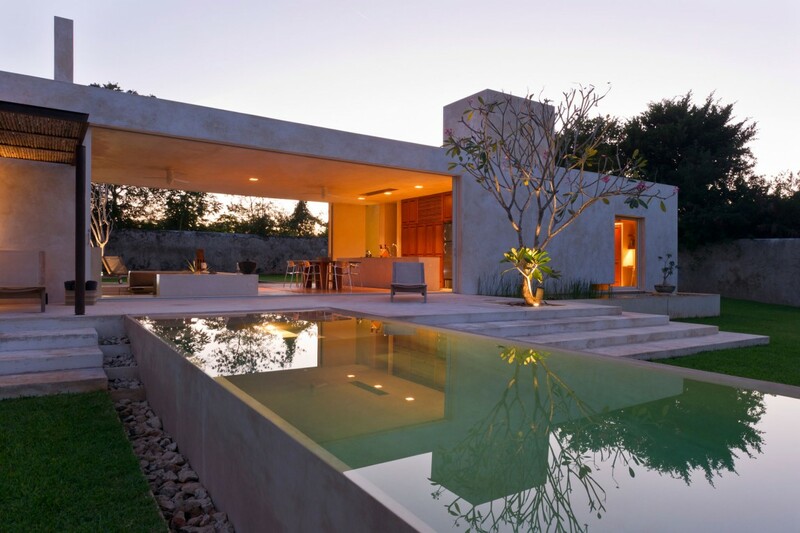 Extensive use of the fine Chukum stucco on the house included the swimming pool and the ponds for water gardens. The resin from the Chukum tree has natural sealant properties and adds a warm off-white pink hue without adding artificial coloring. It is obtained by boiling twice the Chukum tree bark, using the resulting water to develop the mixture, and adding limestone. 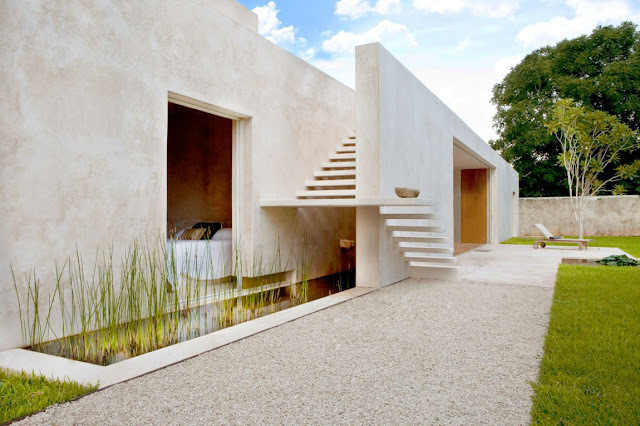 This stucco is a modern reinvention of a Mayan technique that used the Chukum resin mixed with lime and “Sascab” sand to coat open-air water deposits since the prehispanic era. 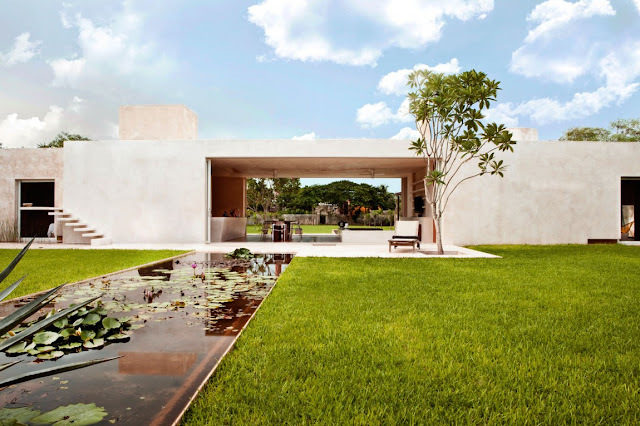 The viability of its application within time and budgetary constraints, using modern materials such as the white cement, is the product of observation and experimentation promoted by the architect Salvador Reyes Rios, who achieved its successful application for the first time in Yucatan in 1996. Since then, its use has been refined and improved in the architect’s works, and has also spread and become more popular as a finish material within Yucatan and later in works by other architects. 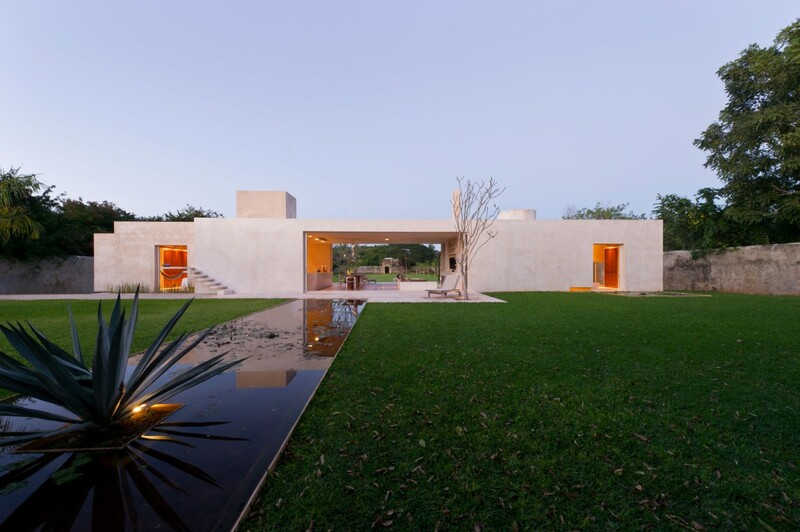 This project reinterprets the traditional architectural typology of the henequen hacienda houses of Yucatan, which synthesize knowledge gathered over time about passive adaptation to the weather. 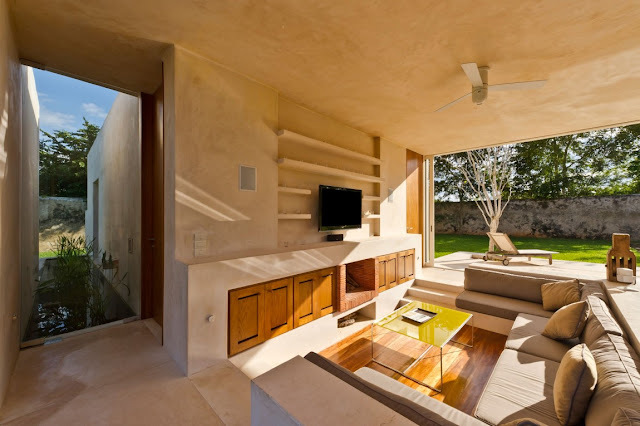 Based on this, the architectural design of the house makes artificial air conditioning unnecessary. 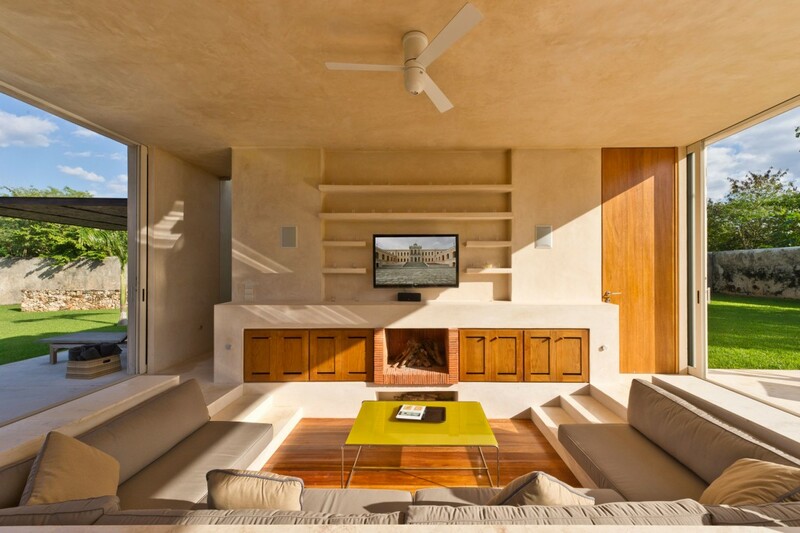 The use of the Chukum mixture completely eliminates the need for colorings and paints. As a consequence, there is a considerable saving of energy and maintenance costs over the entire lifespan of the building. 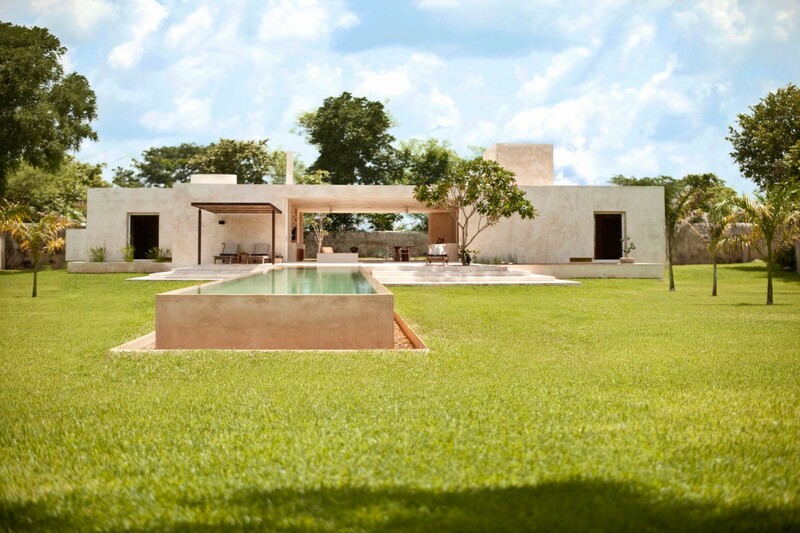 This architectural work promoted the use of local labor, giving value to the natural sense of the “organic and imperfect” character of the work of the masons of the Sacchich village and other rural villages in Yucatan. The thermal and acoustic insulation in roofs was achieved using high density polystyrene panels over prefabricated concrete slabs. Tempered glass laminated with UV film for thermal insulation was used in every window in the house.